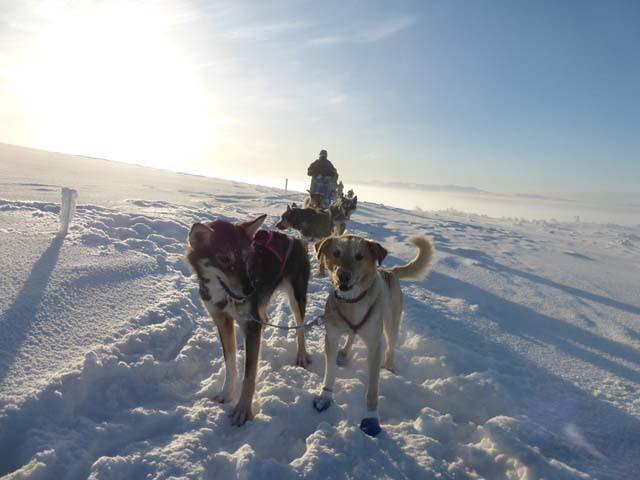 Jayne from the Nature Travels team joined our Dog Sledding and Northern Lights in Vindelfjällen tour in February 2018. In the very comfortable and warm guest house we were given the snow scooter overalls, winter boots & liners and other equipment that we would be using for the duration of our dog sled trip. Trying the winter clothing on inside to ensure we had the right fit was a little like being in your own personal sauna, but stepping outside into the balmy -16 degrees Celsius weather you soon felt the benefit of it. Cabin at the kennels. Photo: Nature Travels. 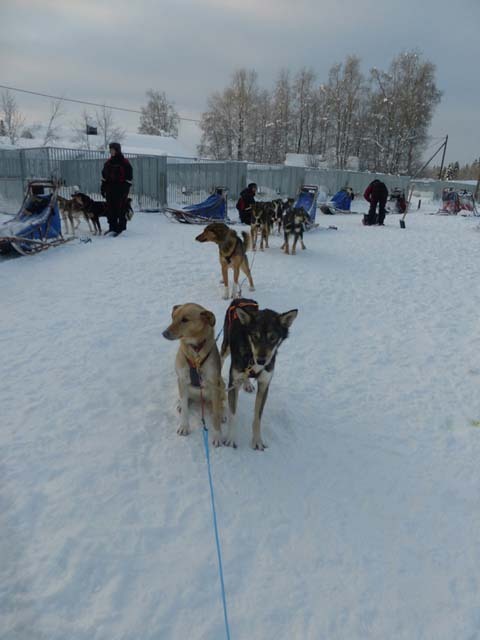 We were then taken up to kennels (a short drive away) where we got to meet some of the dogs including some very cute puppies and were told the basics of dog sledding and about the braking systems on the sled. Feeding time! Photo: Jayne Nature Travels. There was a lot of activity and excitement at the kennels as some of the dogs were being entered in the Femundløpet, a 600km race, and so they had to be taken to the vets to make sure they were fit and healthy for the race, so there were lots of excitable dogs being walked to and from their kennels. It was interesting to see the workings of a racing kennels and to learn about the planning that goes in to preparing for a distance race. 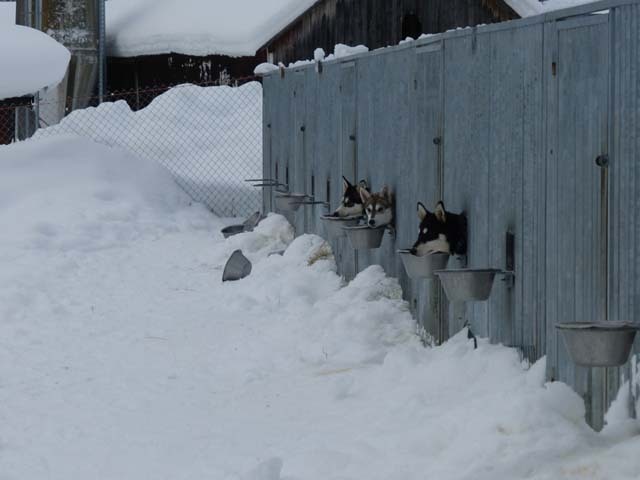 The next day after a hearty breakfast of porridge we went to the kennels to begin the task of loading our sled and harnessing the dogs. My 5 dogs were Fifi (my lead), Ms. Mott (my second lead), Red (my swing), Flipper and Bugsy (my two wheel dogs). 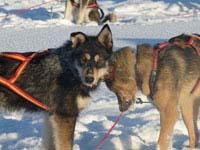 Some dogs were very willing to be clipped to their harness and be walked nicely to the sled to be attached. Others were far too excited and saw the opening of their door as a chance to run about the kennels a little (namely Flipper and Bugsy! ), luckily they were also quite easy to catch! Harnessing the husky teams. Photo: Jayne Nature Travels. Then we were off, I am not sure I will ever get used to the change in the dogs from being so bouncy, loud and excitable when they are waiting to set off to completely silent and focused (mostly) on running. The dogs are very strong and love to run, so with 5 dogs each we were flying along though the snow covered forests and over frozen lakes. Even though I have been dog sledding before at first I spent a lot of time thinking about keeping my distance from the sled in front, not breaking too hard and basically wanting to be a good dog sledder. So for about the first 20 mins of the trip I was focused solely on my dogs and my sled, as soon as I felt happy that I was doing okay I could start to take more notice of the beautiful surroundings and enjoy the peaceful quiet. 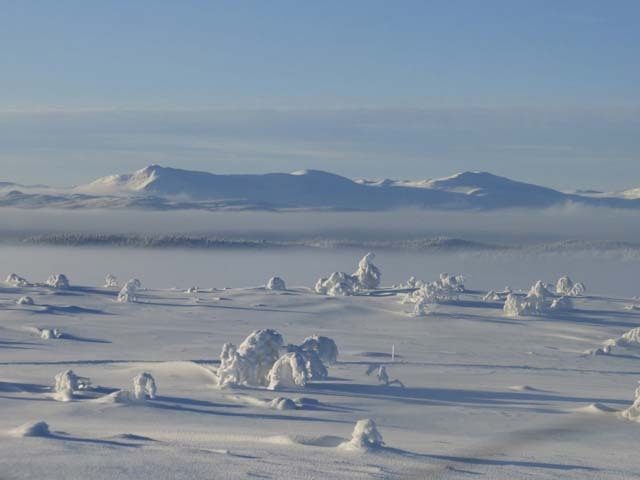 The beautiful winter mountain landscape. Photo: Jayne Nature Travels. After a full day of sledding we arrived at the cabin – some were a little cold and tired, but, before we could think of ourselves we needed to make sure the dogs were sorted and ready for the evening, taking off their harnesses & booties (which they would take off themselves given half the chance), putting out straw for their beds ands putting coats on them. Usually all dogs sleep outside but on our tour we had Ellie, who was a little older than the rest of the group and who was very special so she got to sleep in the cabins with us. 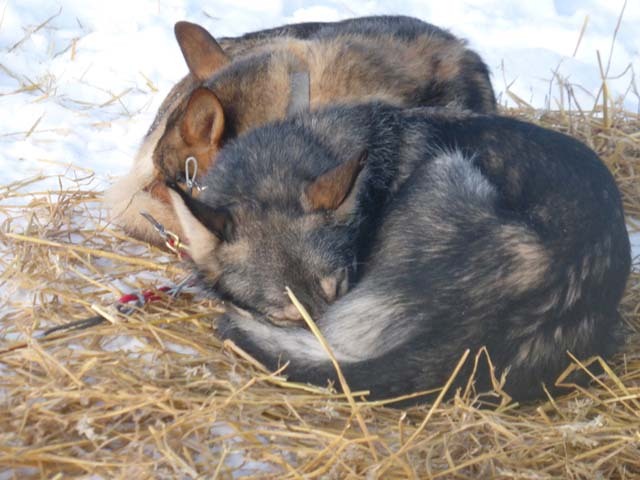 Curling up after a hard day on the trail! Photo: Jayne Nature Travels. 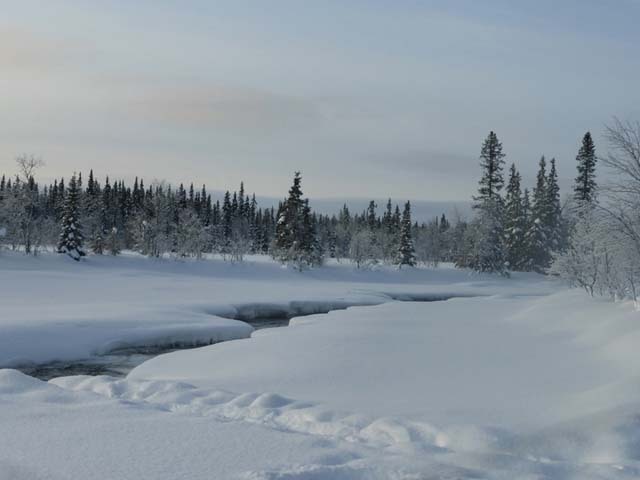 The cabin was right beside a river which hadn’t quite frozen over and was surrounded by trees it felt very tranquil. 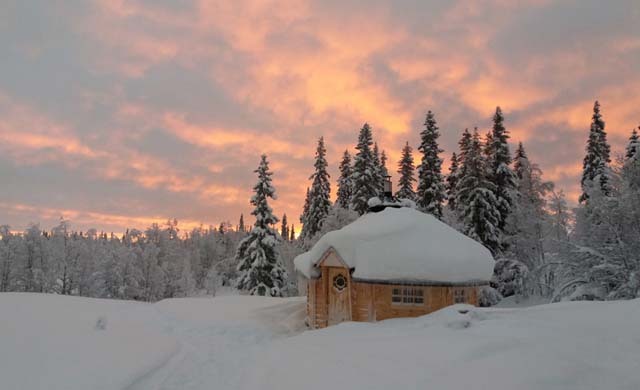 Once the fire had heated up the cabin it was very cosy inside and that night we tucked in to a lovely feast of moose and potatoes cooked by our guide, Flo, outside on a muurikka. Passing the river. Photo: Jayne Nature Travels. 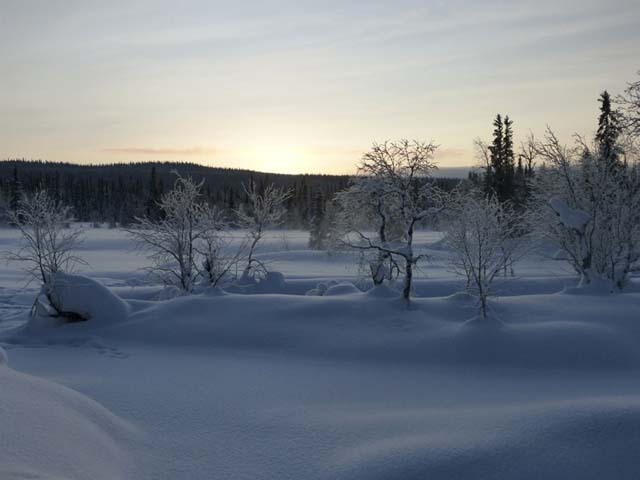 The second day of dog sledding is billed as the hardest of the three, about 42km long with some steep sections taking you up a mountain (when you have to get off the sled and help the dogs by walking behind) but once at the top there is only one way to go and that is down! Despite it being quite cold (the temperature for our trip was between around -16 to -27 degrees Celsius) we were very lucky with the weather, and so we stopped for lunch at the top of the mountain to make the most of the clear weather and the view. Although it did mean that for this lunch we didn’t have a fire so it was a little colder than on the other days. No-one here! Photo: Jayne Nature Travels. Taking a break on top of the world. Photo: Jayne Nature Travels. After a fairly short lunch we set off down the mountain, breaking against 5 powerful dogs can be quite hard, especially when trying to duck under branches and steer but it was also very fun and possibly one of my favourite parts of the trip! Sunshine and sledding! Photo: F. Marien. The second cabin on our tour was much larger than I was expecting with an upstairs (which wasn’t used in winter as it is would take a long time to heat the whole cabin and a lot of fires!) as well as a kitchen, separate sleeping room and an extra room between the two. In this cabin we had two fires to heat the downstairs one in the kitchen and a great wood burner in the sleeping room which soon had the whole place nice and toasty warm. 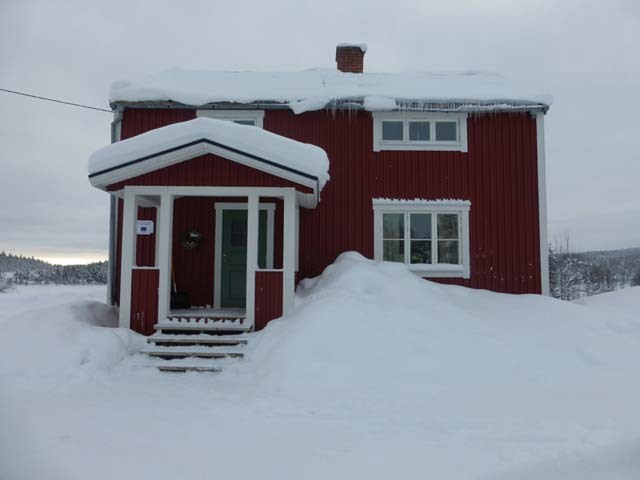 This cabin also had a sauna in a separate building, for me having a sauna is one of the best things about travelling to the Nordic countries and whilst out dog sledding it also gives you chance to wash using the water heated up by the sauna. Sauna at sunset. Photo: K. Nicholas. On our final day of dog sledding at lunch we had the option of taking a shorter way back to the kennels or a longer route with some more up hill sections, we of course chose the longer route (anything to spend more time with the dogs)! Due to a slightly longer lunch break it meant that we were travelling for some of the journey back as the sun was setting; the view of the mountains with the quiet forests below and the sun setting was just stunning. All too soon we were back at the kennels and unharnessing our dogs for the last time. I was sad to say goodbye to my team and I would have gladly taken them all home with me, though I am not too sure how my two dogs would have felt about it! 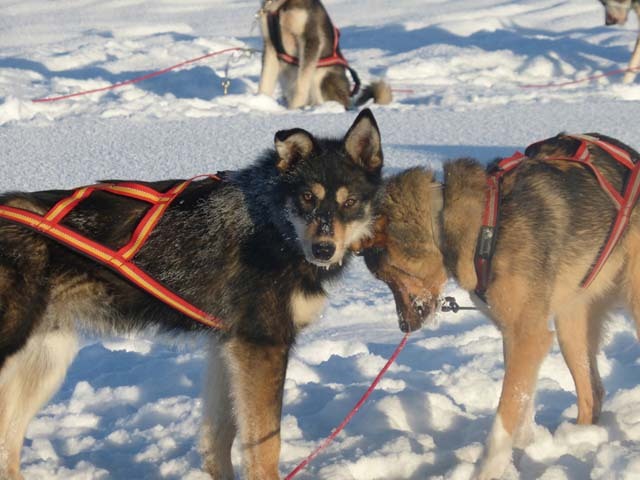 It’s the dogs themselves that make dog sledding such a wonderful experience. Photo: Jayne Nature Travels. That evening after a sauna and a shower we sat down to a delicious meal which was the best way to end what had been an amazing few days in the wilderness. 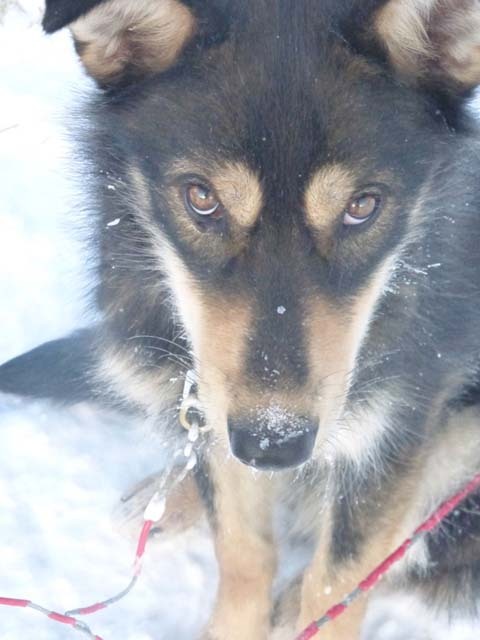 How could that face now make one want to come dog sledding?! Photo: Jayne Nature Travels. 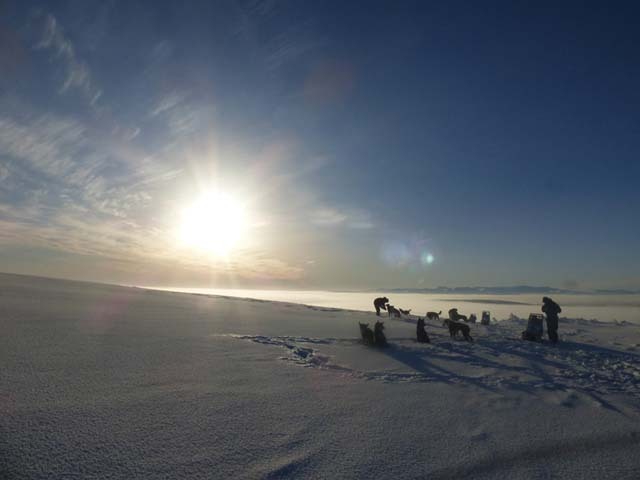 We also offer an 8-day version of this tour, Wilderness Dogsled Adventure in Vindelfjällen.